We’d love your help. Let us know what’s wrong with this preview of Notes from a Coma by Mike McCormack. JJ O’ Malley, adopted from a Romanian orphanage by a single father in the west of Ireland, grows up a permanent outsider, and yet he finds his place in the community. At least until his world is shaken by the death of his best friend, and he volunteers for the “Somnos Project,” an experimental program testing deep coma as a potential option in the EU penal system. In a JJ O’ Malley, adopted from a Romanian orphanage by a single father in the west of Ireland, grows up a permanent outsider, and yet he finds his place in the community. At least until his world is shaken by the death of his best friend, and he volunteers for the “Somnos Project,” an experimental program testing deep coma as a potential option in the EU penal system. To ask other readers questions about Notes from a Coma, please sign up. I loved the plot of this book but it just didn't come together. The synopsis on the back is totally misleading. THAT'S the book I wanted to read. The book was like an interview of friends and family of the main character but you were never properly introduced to HIM. I loved the writing style of the author, minus the distracting footnotes that would've been better served as the main focus of the novel. I'd probably read something else by McCormack. I received this book for free in exchange for an I loved the plot of this book but it just didn't come together. The synopsis on the back is totally misleading. THAT'S the book I wanted to read. The book was like an interview of friends and family of the main character but you were never properly introduced to HIM. Two stories in one - the life of a young man (dark) and his participation in a governmental experiment. The story of JJ's life is a fast read; the footnotes of the coma (the experiment) impossible to read- philosophical, academic, psychological, political babble. If you do decide to read this book, read the story, then go back and read the footnotes. Disclaimer: I received a free review copy of this book at ALA Midwinter 2013. All quotes are based on an uncorrected text. By all accounts, JJ O’Malley is a somewhat unusual young man. Adopted from a Romanian orphanage by an old Irish bachelor, and taken back to County Mayo, Ireland, JJ is raised there, and grows up to show a prodigious intellect. But in some respects, JJ is too smart for his own good, and his mind seems to eat at itself, spinning endlessly through impossible questions and conjec Disclaimer: I received a free review copy of this book at ALA Midwinter 2013. All quotes are based on an uncorrected text. By all accounts, JJ O’Malley is a somewhat unusual young man. Adopted from a Romanian orphanage by an old Irish bachelor, and taken back to County Mayo, Ireland, JJ is raised there, and grows up to show a prodigious intellect. But in some respects, JJ is too smart for his own good, and his mind seems to eat at itself, spinning endlessly through impossible questions and conjectures, occasionally driving him to unusual behaviour. So when Ireland announces its participation in the Somnos Project, a European Union penal experiment in which criminals can serve their sentences in a deep coma, JJ volunteers to serve as the control patient. The unusual experiment draws attention from around the world and overnight JJ and his fellow prisoners become celebrities almost in the manner of reality television. JJ spends the novel in his artificially induced coma, and his story is told to us by his father, his girlfriend, a former teacher, a family friend, and his member of parliament, who was responsible for Ireland’s participation in the experiment. Their different relationships to JJ build on one another to slowly reveal different aspects of his character and his past. Each voice is distinct and carefully realized, reflecting the age, gender and class of the speaker. Coma-bound, JJ does not speak for himself, but only in their memories. In a way, the reader becomes the fascinated public of the novel, eager for more information about the celebrity, but unable to access him directly. The voices of JJ’s family and friends are counterpointed by frequent footnotes, which are sometimes only tangentially related to the point in the story at which they are attached. The language of the footnotes diverges sharply, taking a high academic tone in contrast to the more colloquial monologues of JJ’s loved ones. Some provide supplemental information about Irish history and geography, while others philosophize about the cultural and ethical implications of the Somnos Project. At times however, the academese was so exaggerated, that I was put in mind of the Sokal Hoax. Many of these footnotes are long and sprawling, extending across as much as five pages, and making it difficult to return to the flow of the narrative. I experimented with reading each footnote as it arose, and with reading all of the footnotes at the end of a chapter, but was unable arrive at a satisfying method for getting through them. Despite the intriguing science fiction premise, I would hesitate to classify the book as such. The Somnos Project is, in some ways, almost incidental to JJ’s story, which is quite compelling even before he becomes involved with the penal experiment. It is a story of politics, psychology, metaphysics and family that defies easy classification. This is a very peculiar book. The story is told in two different parts, that seem independent, but that complement each other. The main story is narrated in the “main” body of the book, by the perspective of the characters, and the secondary story is narrated on footnotes. This is the very first book that I read with this structure, and I must say that it exceeded by far my expectations. The author was unknown to me, so I didn’t know what to expect from the book, but I must say that I was pleasan This is a very peculiar book. The story is told in two different parts, that seem independent, but that complement each other. The main story is narrated in the “main” body of the book, by the perspective of the characters, and the secondary story is narrated on footnotes. This is the very first book that I read with this structure, and I must say that it exceeded by far my expectations. The author was unknown to me, so I didn’t know what to expect from the book, but I must say that I was pleasantly surprised. JJ is a very unique character, a gifted and troubled boy, who is much different than the people that surround them. After some events that make him go through a rough time, he decides to volunteer for a pioneer experimental project: Somnos – the project consists of inducing a coma to convicts of crimes, decreasing the expenses with their imprisonment. The biggest downside that I can point out, is that it can be daunting to go back and forth through the book to be able to read both parts of the story at the same time. Other than that, I find that this book is a very nice piece of literary fiction, and I’m very glad that I’ve been given the opportunity to review it before its public release. Notes From a Coma is a fascinating, complex, and utterly amazing book. Set in an Ireland that is present day (or close to it) but slightly altered, it tells the story of JJ O'Malley- he is a super-intelligent, and densely layered young man. This break comes in the form of him volunteering for an experimental prison concept, which aims to put convicts into deep coma for some portion of their sentence. While it is known he is completely innocent, JJ volunteers as a control and has complex reasons Notes From a Coma is a fascinating, complex, and utterly amazing book. Set in an Ireland that is present day (or close to it) but slightly altered, it tells the story of JJ O'Malley- he is a super-intelligent, and densely layered young man. This break comes in the form of him volunteering for an experimental prison concept, which aims to put convicts into deep coma for some portion of their sentence. While it is known he is completely innocent, JJ volunteers as a control and has complex reasons for doing so. The book features a radical format of two concurrent storylines- one in the main body of the text focusing mainly on JJ's origins. This storyline is written from the perspectives of multiple people who knew him. The other storyline focuses on the present- what JJ has become and the various cultural implications therein. This storyline is presented as footnotes to the other one (the "Notes" referred to in the title). While confusing and disjointed at first, I found myself racing ahead to read through each section as they overlapped. It was kind of fun. I had no idea what to expect from this book. I received it some time ago as part of the Goodreads Giveaway program, but I was travelling a lot. I kept picking it up and wanted to want to read it, but I couldn't quite get there. When I finally did, I read it nearly straight through. I had never heard of the author, and couldn't quite get a handle on what this book was going to be, based on the blurb, etc. I don't think anything would have quite prepared me for it, save possibly reading some Goodreads reviews. I pretty much read this in one go. Superb writing. I just wanted to know more about the actual experiment. So many unanswered questions about it and what happened next. It had been a while since I read a book that inspired me as much as Ursula K LeGuin's "Left hand of Darkness"; until, that is, I read "Notes from a Coma". This layered and textured narrative about one lad's journey through love and loss to absolution was by turns funny and heart-wrenching. Like the Irish people he represents, it captures the surface cheer and underlying sorrow of JJ O'Malley; a character never heard from directly, but seen through the eyes of the people in his life. The most won It had been a while since I read a book that inspired me as much as Ursula K LeGuin's "Left hand of Darkness"; until, that is, I read "Notes from a Coma". This layered and textured narrative about one lad's journey through love and loss to absolution was by turns funny and heart-wrenching. Like the Irish people he represents, it captures the surface cheer and underlying sorrow of JJ O'Malley; a character never heard from directly, but seen through the eyes of the people in his life. The most wonderful aspect of the book was the philosophical one. Underlying the book is a thought experiment - an alternative to the current prison system. Through this, the author explores all manners of ethical, technological, legal and socio-political ramifications of such an alternative. By no means exhaustive, the author still sparks enough of an internal dialogue in the reader to provide food for thought for several days and inspire research into the topic. Besides this, the actual narrative of the life of JJ was also thought provoking. I enjoyed reading the multiple person point of view storylines, at different time points and time directionalities; these fractured narratives set up interesting predictions and gaps in knowledge of JJ and his life, engrossing the reader very effectively. The story is simple and poignant; as JJ internalizes his feelings of guilt and tries to atone - as an innocent man - the reader comes away with the knowledge of how he enriches the lives of people around him. Full of ideas and curiosity to begin with, the guilt almost snuffs out the light in him due to events that transpire out of his control. This is easy to relate to for anyone who feels deeply. The only thing that was the drawback for me was the sheer volume and verbosity of some of the footnotes. I loved most of them, but sometimes, it just felt like the author was showing off his proficiency of the language, using a string of barely pronounceable words to ineffectively say something inane. Other footnotes were delightful, funny and insightful. As a neuroscientist, I was also tickled by the neuro aspect of the somnos project. The idea of continuously monitoring brain activity without any specific scientific question makes it improbable, but still highly entertaining. Fundamentally though, the author tries to raise questions about consciousness, and sometimes the appeal in being able to turn off the continuous narrative in our heads. The quality of this review has much to do with Firefox' ability to present a stable platform. Having written a long review it became lost to the ether when Crash City occurred. 3 star - nearer three than four. A hell of an undertaking for a slim book. Stylistically difficult - footnotes presenting another line to the text - a further subtext - which examines other attributes and develops questions and issues raised by the text. These become intrusive - or extrusive! one might The quality of this review has much to do with Firefox' ability to present a stable platform. Having written a long review it became lost to the ether when Crash City occurred. Stylistically difficult - footnotes presenting another line to the text - a further subtext - which examines other attributes and develops questions and issues raised by the text. These become intrusive - or extrusive! one might say - as they run along the bottom of the page over several pages. Why not just present them in the body of the text inset block quote-like in italics IN the body of the text which is where they formally stand, not as footnotes. Gripe 1. Gripe 2. Its almost trying to outsmart itself. In a look-at-me-ain't-I-good sort of way. The ideas about Coma - lack of consciousness - are really only followed in the footnotes which have the same kind of 'smart arse' taste to them as some of the taste of the main body of text. And yet....... and yet....... isn't there always an 'and yet'. Some of the writing is great, beautiful even at times, with the occasional canny observation and wry turn of phrase that catches you unawares. But in the end it skates the issues it raises, avoiding for the main part the issue set out. The observation of life through the eyes of the nearest and dearest observers to the protagonist is always a useful tool. It allows O'Malley AND the other characters to share in the development of the book. a little too like a student with a slick first night stand-up comic routine. You've seen 'em. They all seem the same in the end. Wry observations. A little bit leftie liberally. Cosy even. So I'm still left with the thought that yer man might be the Emperor's New Clothes rather than the New Monarch of the Glen. Enjoyable. I've rarely read an author more adept at providing a unique voice to each of their characters. I had expected the novel to revolve around the Somnos experiment, but instead it was a character-driven tale focused on the small Irish community where one of the volunteers grew up. Other than the footnotes, the entire story recalls the years before the experiment began. The long, meandering footnotes, written in a style to contrast the folksy narrative, were fun, though the author occasion Enjoyable. I've rarely read an author more adept at providing a unique voice to each of their characters. I had expected the novel to revolve around the Somnos experiment, but instead it was a character-driven tale focused on the small Irish community where one of the volunteers grew up. Other than the footnotes, the entire story recalls the years before the experiment began. The long, meandering footnotes, written in a style to contrast the folksy narrative, were fun, though the author occasionally gets away from himself, having a bit too much fun rambling at the expense of the story. Exceptional. It’s a more subtle commentary on Ireland than Donal Ryan’s works, but also completely absorbing, clever, and challenging. The ‘sci-fi’ label is a bit of a misnomer, as ‘sci-fi’ as 1984 but on a much more compact and human scale. Somber, intense, thought-provoking .. both a provocative novel of ideas and an intimate character study. Except that the author is much more intelligent than me. A new experiment is being set up in the EU to test how medically-induced comas might benefit the prison system, but first an innocent person must volunteer as the control. J.J. O’Malley needs to spend some time away from his own overactive mind, and three months of unconsciousness via the Somnos project seems like the perfect fit. I picked this book because the premise seemed like science fiction, although it wasn’t advertised as such. I had to do some digging to confirm that it fit the theme, and even though it was very much a story about one person’s mind and life, the science fiction element of the plot is ever-present. Although it is literally a footnote for most of the book, it is a very large footnote, both in terms of actual space on a given page and its place in the mind of the reader. Yes, that’s right—a great deal of this story is told in footnotes which are interspersed throughout the narrative in places which often seem completely unrelated to the actual content of the footnotes. I could almost never tell what the footnote had to do with the sentence it was attached to, and this annoyed me quite a bit, as well as the fact that it took me a couple of chapters to realize each chapter was told from a different point of view (I admit this was partially my fault, since each chapter is clearly labeled with the name of the person who’s telling the story). Let me spare you some grief right now by explaining that the book is set up as if the reader is a journalist or investigator compiling notes on J.J.’s life—thus the sections of narrative from several different people, and the footnotes about the Somnos project. About halfway through the book I managed to get over the footnote issue and accept that it served an atmospheric purpose even if I would have preferred the notes be delegated to separate chapters rather than being constant interruptions. Sometimes it’s difficult to separate writing style and plot execution, or to decide which aspects of both deserve a certain grade. Because the way the story is told—complete with the interrupting footnotes and constantly switching viewpoints—is part of what makes it so haunting, I can’t decide if I love or hate it. I enjoyed the voice of each actual chapter well enough—each of J.J.’s family members and friends were well-fleshed-out and their colloquialisms gave me a raw feeling of immersion in the life of their little Irish town of the modern age. But the footnotes were told from a perspective of being ever-present in some future when these chapters had already happened and the Somnos project was nearly complete. If that wasn’t disorienting enough, the writing style employed there is so vague and abstract that the footnotes gave me very little actual information about the project. Even after finishing the book, I can’t tell you exactly what the Somnos project hoped to accomplish (apart from proving a way to imprison people on a smaller budget), or why J.J.’s brainwave patterns became the most interesting thing on the internet. Maybe the reason for my confusion is that I was waiting for some ulterior motive behind the project to be revealed, and it never was. The project wasn’t the point of the book, but merely one piece of the world interacting with all the other pieces in J.J.’s uniquely tormented consciousness. Mike McCormack’s Notes from a Coma made quite a splash in Ireland when it was published there in 2005, receiving such a good reception from readers and critics that it was shortlisted in 2006 for the Irish Book of the Year award. Now it makes its American debut as a Soho Paperback Original. The book has a strange feel to it. Because it was written eight years ago, it is set in the recent past – but with just enough spin on that past to give the story a bit of a surrealistic science fiction feel. 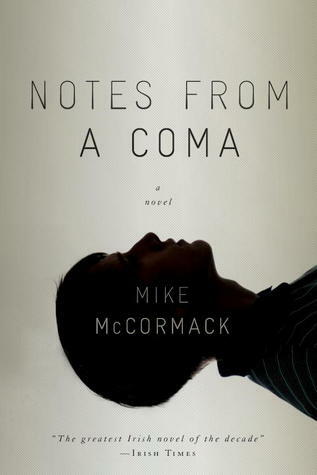 Mike McCormack’s Notes from a Coma made quite a splash in Ireland when it was published there in 2005, receiving such a good reception from readers and critics that it was shortlisted in 2006 for the Irish Book of the Year award. Now it makes its American debut as a Soho Paperback Original. Anthony O’Malley, a lonely Irish farmer, plucked JJ from a filthy Romanian orphanage not long after the overthrow of that country’s communist government. It was a relatively simple cash transaction (something that would haunt JJ’s self-esteem when he figured it out), and in a matter of days the naïve Irishman was back on the farm with his months-old son. And, with much help from a neighbor’s wife who had a young son of her own, the brilliant JJ O’Malley thrived in his new world. JJ O’Malley is one of those students who have their teachers scrambling just to keep up with them, much less stay one step ahead. He fits in well, the community takes pride in him, and he has long-term girlfriend and a best friend he considers to be more his brother. Then one day JJ’s emotional security is devastated by a shocking loss that no one can help him work his way through. But when the young man ends up on a prison ship docked in nearby Killary Harbor, part of an ambitious medical experiment he has volunteered for, the town is still proud of him. The European Penal Commission is looking for an alternative it can offer to first-time offenders being incarcerated for what it considers to be “less serious” crimes. Perhaps, placing these offenders into a deep coma under strict medical supervision for the duration of their sentences is the answer. JJ and his fellow volunteers are on the prison ship to test the theory. Notes from a Coma is a story told simultaneously at two levels. Many, if not most, of the book’s pages include supplementary footnotes that explain everything from the evolution of the Sommos project (as the study is called) to details concerning brain activity and European Union politics. While the notes do add greatly to an understanding of what is happening on board the Event Horizon, readers will have to decide how best to approach them. They might want to read the notes page-by-page as they are presented, read each chapter’s narrative before reading that chapter’s footnotes, or even skip (something I do not recommend) the footnotes altogether. Although I would have preferred an ending with more closure, Notes from a Coma is an intriguing novel that touches on many of the moral and ethical questions of the day. Mike McCormack is one to watch. Like well-crafted counterpoint, Mike McCormack's Notes from a Coma is made up of independent, yet interdependent, parts. Two parts, in this case. The first is the "beautifully rendered look at small-town Irish life" and the life of JJ O'Malley, told in five voices, each of whom is being interviewed by an unknown person. Here the text flows naturally and comfortably. The second part occurs in the footnotes (which are long, often 4-6 pages!). There lies a deeply cerebral exploration of the history Like well-crafted counterpoint, Mike McCormack's Notes from a Coma is made up of independent, yet interdependent, parts. Two parts, in this case. The first is the "beautifully rendered look at small-town Irish life" and the life of JJ O'Malley, told in five voices, each of whom is being interviewed by an unknown person. Here the text flows naturally and comfortably. The second part occurs in the footnotes (which are long, often 4-6 pages!). There lies a deeply cerebral exploration of the history, ethics, and various implications of the Somnos project. It was a challenge to switch back and forth between the easy tone and style of the main text and the difficult passages that make up the footnotes. This duality was certainly a unique way of reading and took some getting used to; it also highlighted McCormack's versatility and skill as a writer. I felt the book ended much too soon. What were JJ's experiences during those 3 months? What was the general population privy to that raised the Somnos volunteers to such celebrity status? Brief moments would pique my curiosity, but then never develop. That was a little disappointing. I suppose these things were simply left up to the imagination, but I enjoyed McCormack's writing style so much I wanted to read those details. I did expect more science fiction. Coma patients hooked up and feeding out to the Internet?! That has so many possibilities! It's the type of sci-fi I get excited about reading. But this isn't that type of novel. There are hints of science fiction, but ultimately this is a great work of literary/psychological fiction. It is well worth the read. I feel like this is a novel I'll have to return to more than once to properly and completely grasp everything. It's one that doesn't have a lot of action, but it could be said that a lot actually happens. The 'a lot that actually happens' is relayed through the individual stories of different characters connected to the person of interest, JJ. JJ is a brilliant individual and while his brilliance does come across in the novel, so does his difficult personality. He is self-absorbed, due perhaps t I feel like this is a novel I'll have to return to more than once to properly and completely grasp everything. It's one that doesn't have a lot of action, but it could be said that a lot actually happens. The 'a lot that actually happens' is relayed through the individual stories of different characters connected to the person of interest, JJ. JJ is a brilliant individual and while his brilliance does come across in the novel, so does his difficult personality. He is self-absorbed, due perhaps to his intelligence/genius, and the decisions he makes throughout reflect this. He is written to be likable, or at least that's the impression I get, but I found him difficult to stomach. His actions are taken without thinking of those around him, and it is those individuals around him who I find more likable. Despite JJ's personality shortcomings, this novel is formatted successfully (it does remind me of Faulkner's "As I Lay Dying") and is extremely well written. The author's footnotes sometimes offer a jumble of words and ideas to wade through, but I do feel they add to the overall story. However, I would have hated to have read this on my Kindle, because the footnotes often continue multiple pages, so the flipping back and forth was a bit tedious in an actual book, and in an eReader I can only assume it would be worse. Mike McCormack's Notes From a Coma was first published in the UK by Jonathan Cape in 2005. This newly reprinted edition by American publisher Soho Press has a cover adorned in lavish praise: "The greatest Irish novel of the decade" (Irish Times); "The next step in Irish fiction...visionary" (author David Means); and "The finest book yet from one of Ireland's most singular contemporary writers" (author Matt Bell). Any wonder I was itching to read it? At its simplest level Notes From a Coma is the ta Mike McCormack's Notes From a Coma was first published in the UK by Jonathan Cape in 2005. At its simplest level Notes From a Coma is the tale of JJ O'Malley, a Romanian orphan who is adopted by an Irish bachelor and raised in the west of Ireland. JJ's childhood is a happy one, but his life goes off the rails as a young adult when his best friend — and the closest thing he ever has to a brother — dies. Plagued by guilt and grief, JJ decides to do something radical and volunteers for a Government experiment in which prisoners are put into a deep coma and kept on a prison ship. So, while this is a charming, easy-to-read tale about one boy's life in small-town Ireland, it also has a strange science fiction element to it. Remember the scene from "(500) Days of Summer" with Tom's expectations and reality playing simultaneously? I keep thinking of that scene as I try to put together how I feel about Mike McCormack's Notes from a Coma. If my expectations for the novel were playing on one side, they would be an almost sci-fi look at the use of deep coma for incarceration, with a focus on J.J., who volunteers for the project. However, in reality, Notes from a Coma centers almost entirely on J.J.'s life leading up to h Remember the scene from "(500) Days of Summer" with Tom's expectations and reality playing simultaneously? I keep thinking of that scene as I try to put together how I feel about Mike McCormack's Notes from a Coma. If my expectations for the novel were playing on one side, they would be an almost sci-fi look at the use of deep coma for incarceration, with a focus on J.J., who volunteers for the project. However, in reality, Notes from a Coma centers almost entirely on J.J.'s life leading up to his entrance into the project; his extreme giftedness, the tragic loss of his best friend and his eventual nervous breakdown. The more detailed information on the Somnos project is told in footnotes, which are more difficult to follow in the digital version than I imagine they would be in a print copy. The length of the more technical footnotes within the interview style text made the novel lose fluidity, making J.J.'s story lose some of its impact. Overall, I was thrown off by the novel I ended up reading as opposed to the book I expected and, honestly, I think I would have preferred the later. While J.J.'s history is definitely key to the story, I feel like Mike McCormack really missed a great opportunity to fully explore the the premise he set the book around. I really don't know what to say about this book. Is is definitely one of the strangest I have read. The book has a general story at the top, and below like footnotes we are gaining knowledge of some "SOMAS" project in very convoluted language. I wished the author could have put these "footnotes" into the main text as it was frustrating to move ahead in the book reading the bottom part, then going back to where I was on the top part. This book was intriguing. The main character JJ is one that I simply loved. He was adopted and although he is eccentric in thought and mannerism, he seems to be accepted in his society. He volunteers for a project which shows his eccentric actions even more. The others in this project are criminals which JJ is not. The project is to deep induced coma. I loved the characters and even how JJ said very little in the actual book. The reader’s knowledge came from other people connected to him and mem This book was intriguing. The main character JJ is one that I simply loved. He was adopted and although he is eccentric in thought and mannerism, he seems to be accepted in his society. He volunteers for a project which shows his eccentric actions even more. The others in this project are criminals which JJ is not. The project is to deep induced coma. I loved the characters and even how JJ said very little in the actual book. The reader’s knowledge came from other people connected to him and memories, this was unique and different. The plot and story line was very good in my mind and thought. The only problem I had was the footnotes… too many, too long and they interrupted the storyline. It was very hard to read a little, read a footnote and then go back to the story. The story would have read so much smoother if the information had been blended in with the book itself. Without the footnote issue I would have rated this book higher. I did receive this book via goodreads and certainly do appreciate the chance to read it. The book tells the story of JJ's life from alternating view points of the people in his life. Then it also has footnotes that add information about the coma project, it's science and the way the public reacted to it. I enjoyed all of the different voices telling JJ's story. I thought he was a deeply compelling character and his outlook on life was fascinating. The "notes from a coma" are really just the footnotes, because that is the only information you really get about his time in the coma. I The book tells the story of JJ's life from alternating view points of the people in his life. Then it also has footnotes that add information about the coma project, it's science and the way the public reacted to it. I enjoyed all of the different voices telling JJ's story. I thought he was a deeply compelling character and his outlook on life was fascinating. The "notes from a coma" are really just the footnotes, because that is the only information you really get about his time in the coma. I think some readers were disappointed by that, but I liked the story so much and thought the whole thing such an interesting premise that it didn't bother me. And, while I think there was room for more story, I even liked the ending though it may be too abrupt for some. Fascinating. JJ O'Malley, a young man adopted as a baby from a Romanian orphanage by a single Irish man, takes part in an experiment that involves being put in a coma for three months. The book takes us through the events that led him to volunteer for the study, told from the perspectives of JJ and several people close to him. The story explores JJ's struggle with his identity and with his extraordinary intelligence and the effects of those challenges on his relationships with family and friends Fascinating. JJ O'Malley, a young man adopted as a baby from a Romanian orphanage by a single Irish man, takes part in an experiment that involves being put in a coma for three months. The book takes us through the events that led him to volunteer for the study, told from the perspectives of JJ and several people close to him. The story explores JJ's struggle with his identity and with his extraordinary intelligence and the effects of those challenges on his relationships with family and friends. The book is beautifully written, with sympathetic characters and thought-provoking ideas. A Brave New World crossed with Reality TV, which places it half-way between brilliant and insipid. McCormack seems to be mocking modern culture and philosophical pretentiousness at the same time, which is not hard to do, but very hard to do well. The footnotes alone are maddening, a kind of academic frosting that adds little sweetness and marginal decoration. What saves the book are the characters, who are real and heart felt and drawn very well. McCormack opens the book with epigraphs from Kafk A Brave New World crossed with Reality TV, which places it half-way between brilliant and insipid. McCormack seems to be mocking modern culture and philosophical pretentiousness at the same time, which is not hard to do, but very hard to do well. The footnotes alone are maddening, a kind of academic frosting that adds little sweetness and marginal decoration. What saves the book are the characters, who are real and heart felt and drawn very well.